How do I access or submit my Academic Writing Evaluation (AWE) task? Instructions for how to download the task or upload your response, for an Academic Writing Evaluation (AWE) task. Note: Only students who have been assigned/tasked with completing an AWE are able to submit one. 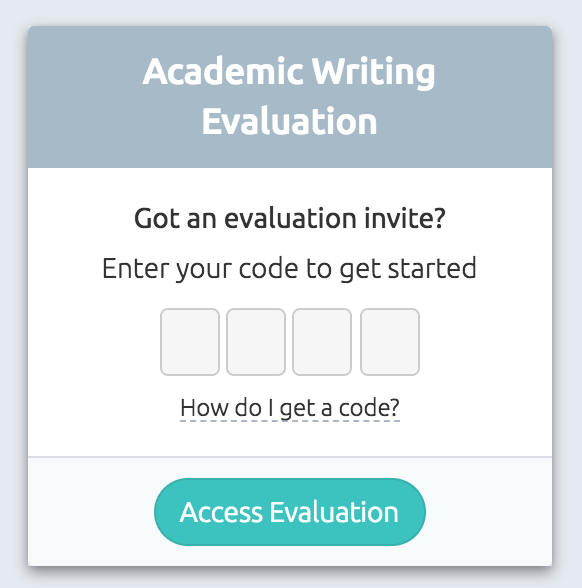 To complete your Academic Writing Evaluation task, simply log in to your Studiosity account as usual. You should have received a 4-digit code from your education provider, to access the task. If you have not received a code, please ask your teacher/lecturer or contact us on hello@studiosity.com. Type that code into the box on the right hand side of the screen (it looks like the image below). Remember or keep your code, you will need it in order to access AWE again to submit your document. Above: a quick walkthrough of how to access Academic Writing Evaluation to retrieve your task. There you'll see the instructions on how to download and complete the task, as well as its due date. Once you have completed the writing exercise (in a word doc or other text format), you can do the same steps as above, using your 4-digit code, to come back in to the Academic Writing Evaluation task screen, and submit your work (see the video below). Then, sit back, relax and wait for your feedback! It should be returned to you in under 72 hours. We'll send you an email when it's ready to view.